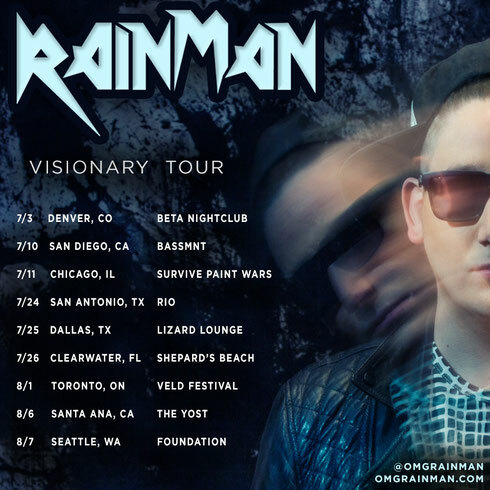 Armed with his first solo singles “Visionary Ft. Sirah” and “Make The Fire Burn” (free download), Rain Man is hitting the road this summer for the Visionary Tour. The hard-hitting DJ/producer kicks it off 3 July in Denver and treks through the south, Midwest and Canada’s Veld Festival with a close out at Seattle’s Foundation Club on 7 August. Rain Man’s been spending the last few months holed up in the studio so this tour offers a great opportunity for him to unleash a full cache of never before heard music. Grab his free download below of ‘Make The Fire Burn’.